The thirteenth annual Meridian Winter Blast, presented by Quicken Loans, has been moved up several weeks and is now scheduled to coincide with the final weekend of the North American International Auto Show — January 20-22. The event will feature a new layout and several new winter attractions, including the 30-foot-high Meridian winter slide, where thrill-seekers can ride through a pitch-black tube, dropping them quickly from a steep 40-degree angle at speeds of up to 20 miles per hour. Those feeling less adventurous can also opt for a 30-degree drop slide that still promises to excite festival goers. There will also be a 30-foot by 40-foot ice maze located on Woodward Ave. south of Campus Martius, which will be created by hundreds of large ice blocks. 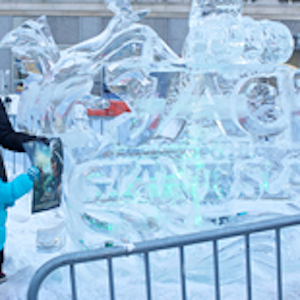 In the evenings, adults can enjoy the Bedrock Ice Bar located on Cadillac St. north of Cadillac Square and will include a 16-foot bar made of carved ice, as well as tables, chairs, carafes, and drinks. Portable heaters and music will also be provided 6-11 p.m. Friday and Saturday and 6-9 p.m. Sunday. Meridian Winter Blast will also feature a variety of food trucks including a dozen local restaurants and start-ups. The list of participating food trucks thus far includes Beans & Cornbread, Bigalora, Buffy’s Mexi-cation Grill, Chef in a Box, Hero or Villain Deli, Mac Shack, Matt & Mo’s, Nosh Pit, Soaring Eagle Cuisine Machine and Shredderz. Food trucks will be stationed along Monroe Street starting outside the Hard Rock Café to serve hungry festivalgoers. Admission to the Meridian Winter Blast is $3, three canned food items, or one children’s book, which will help to fight hunger and promote literacy in Metro Detroit.